Baseball’s newest Hall of Famer, John Smoltz, has worked with Shaw Sports Turf to develop the TruHop synthetic turf system and is now spending more time helping to improve synthetic turf for baseball. 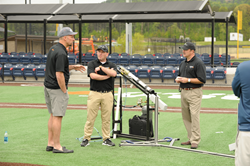 Smoltz worked with the Shaw Sports Turf R&D department to develop the system, which can custom designed to meet the performance specifications of the customer. .
“I’m telling you, it’s going to revolutionize the sport,” said Smoltz. Smoltz has spent time at LakePoint Sporting Community in Georgia to help continue to develop the best baseball system available. LakePoint is the world’s largest tournament sports destination. The TruHop system has been installed throughout the country and is gaining momentum as the premier synthetic turf system for baseball.